A raccoon bite on the arm doesn't seem that serious, but it soon becomes a life-or-death medical crisis for Melissa Loomis. After days of treatment for recurring infection, it becomes obvious that her arm must be amputated. Dr. Ajay Seth, the son of immigrant parents from India and a local orthopaedic surgeon in private practice, performs his first-ever amputation procedure. In the months that follow, divine intervention, combined with Melissa's determination and Dr. Seth's disciplined commitment and dedication to his patients, brings about the opportunity for a medical breakthrough that will potentially transform the lives of amputees around the world. 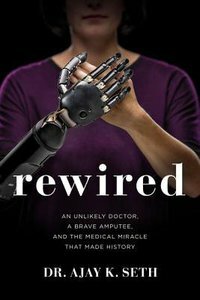 Rewired is the inspirational, miraculous story of Dr. Seth's revolutionary surgery that allows Melissa to not just move a prosthetic arm simply by thinking, but to actually feel with the prosthetic hand, just as she would with her natural arm. This resulted in what others have recognized as the world's most advanced amputee, all done from Dr. Seth's private practice in a community hospital, using a local staff, and with no special training or extensive research funding. About "Rewired: An Unlikely Doctor, a Brave Amputee and the Medical Miracle That Made History"
Expected to ship within 13 hours from Australia.